You are currently browsing the tag archive for the ‘Apple Brandy’ tag. Now, my favorite things aren’t quite the same as what Julie Andrews sings about (although I do think silver white winters that melt into spring are beautiful), but she’s got a point: When the dog bites, when the bee stings, when I’m feeling sad, I simply remember my favorite things and then I don’t feel so bad. I actually had a pretty great day with my family, so I didn’t need to remember my favorite things to make me feel better. Instead, I was looking for the perfect ending to a really nice day. So, in that spirit, I mixed up one of my favorite cocktails…the Jack Rose. I never get tired of this wonderful drink. And I have found that it’s quite a popular crowd pleaser. The Jack Rose is a classic cocktail that contains applejack, grenadine, and lemon or lime juice. 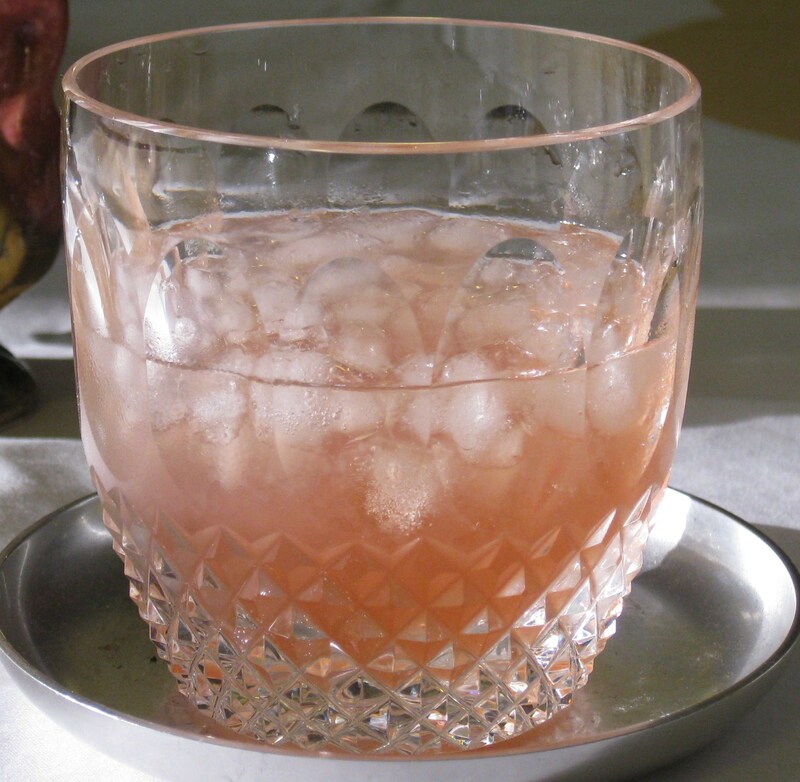 While there a few colorful stories about how this drink came to be and how it got its name, what’s probably closest to the truth is that the name comes from the spirit—applejack—and the rose color from the grenadine. I am not the only one who loves and appreciates the Jack Rose. In Ernest Hemingway’s 1926, The Sun Also Rises, the narrator, Jack Barnes, drinks a Jack Rose in a Paris hotel bar. David Embury cites it as one of the six basic cocktails in The Fine Art of Mixing Drinks (1948). Even Rachel Maddow loves this cocktail. The homemade grenadine is a necessity for this drink, and for any cocktail that calls for it, for that matter. The stuff you may remember from Shirley Temples is, in my opinion, unacceptable—if that makes me a cocktail snob, hey, so be it. Making grenadine is SO easy. Combine equal parts sugar and pure pomegranate juice (grenadine comes from the French word grenade which means pomegranate) in a jar with a tight cap and shake. No need to heat—just shake and let the sugar and pomegranate juice do their thing and transform into a beautifully sweet-tart grenadine. So, whether its door bells and sleigh bells and schnitzel with noodles or a Jack Rose, remember it’s always a good time to enjoy your favorite things. Cheers! Monday night Julie and I went to Drink. We settled into the small ice station bar and began chatting with bartender Joe Staropoli about what we were in the mood for. Julie told Joe that she wanted something spicy—cloves spicy, not jalapeno spicy. This is what led to our introduction to allspice dram which I kind of fell in love with. This amazing stuff, also known as pimento dram, is made with rum and pimento berries, or as we know it, allspice. British explorers in the 18th century thought the dried pimento berry tasted like cinnamon, nutmeg, and clove, all in one, so they called it allspice. But it’s more than that just clove, cinnamon, and nutmeg flavors. There is also a distinctive peppery note that lingers on your tongue. It is just so yum! 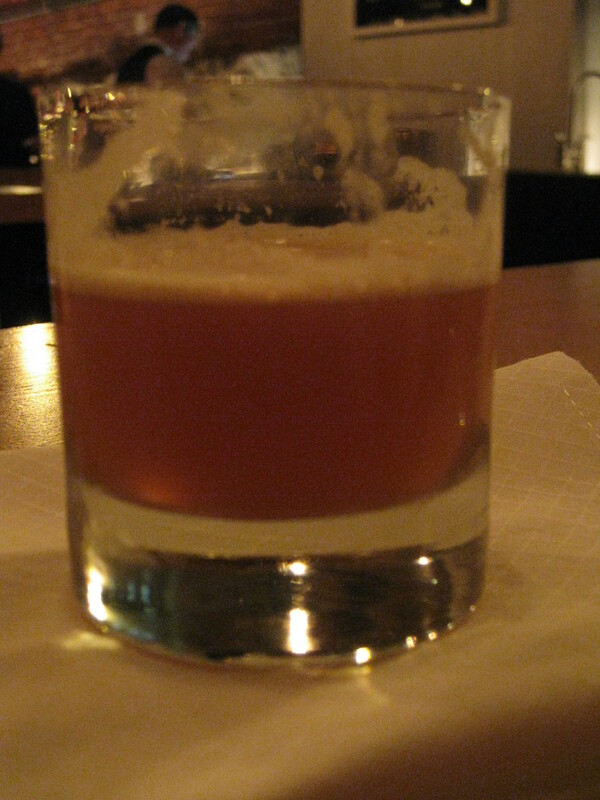 At Joe’s suggestion, Julie enjoyed a Lion’s Tale, a cocktail featured in Café Royal Cocktail Book published in London in 1937. The spiciness of the dram was supported nicely by the warmth of the bourbon. Absolutely delicious! For my second drink, I asked Joe what he could make me with my new favorite ingredient. Do you like ginger, he asked. Yeah, I like ginger. What he mixed up was so good. He calls it Smile at Smolak. 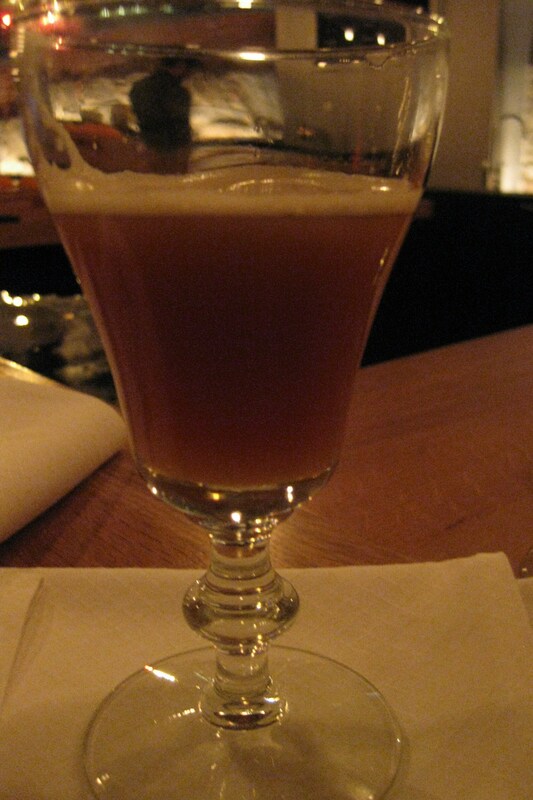 He originally created this drink to satisfy a request for something with autumnal flavors. The name references a farm in North Andover where you can get all your fall staples—apples, pumpkins, etc. [I think there might be more to the story behind this drink, but that’s what I remember.] The apple brandy and Punt de Mes are a solid base upon which the ginger syrup and the allspice can stand and shine. From the first sip, my mouth was tingling with yum spiciness. Here’s to falling in love with allspice dram. Cheers!